Driving the Economy of Silicon Valley: VTA’s Capital Program Delivers which shows how the investments being made in our transportation infrastructure are transforming communities and the lives of people not only in Silicon Valley, but also throughout California. Over the past five years, VTA projects have resulted in more than $1.6 billion in economic activity. While much of this impact and most of the jobs have occurred right here in Silicon Valley, these investments have also benefited communities and people beyond our local area. VTA Transportation Handbook is a reference guide that provides a basic understanding of transportation in Silicon Valley. 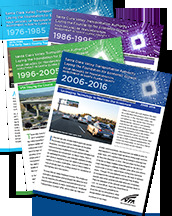 It includes sections on the roles and responsibilities of the Valley Transportation Authority (VTA), transportation funding sources, transportation planning, and key transportation projects that will improve mobility in Silicon Valley. Introduction to Transportation Funding is a primer for understanding the variety of federal, state and local revenue sources that fund transportation in California. It is provided to help individuals, organizations, elected officials and other policy-makers better understand the complex myriad of funding mechanisms that produce a major portion of transportation funding in the state. VTA Combating Climate Change details legislative efforts aimed at fighting climate change. This brochure also highlights the environmental benefits of public transit for protecting the environment and VTA’s sustainability efforts focusing on providing public transportation services in an environmentally way. This revised proposal was presented to the Transit Planning & Operations Committee on April 16th and the VTA Board of Directors on May 7, 2015. VTA Take-One Newsletter is a quarterly publication designed to provide customers with VTA news, rider tips and a schedule of community events. 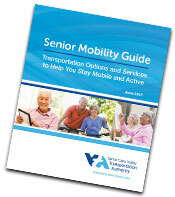 The brochure can be found on VTA buses, light rail and the Customer Service Center located in downtown San Jose. Have a “Daycation” on us! Transportation Options and Services to Help you Stay Mobile and Active. Your safety depends on it! Bike & Ride on VTA buses and light rail. Learn how to make commuting easier and safer. June 2018 - 2000 Measure A Semi-Annual Report.